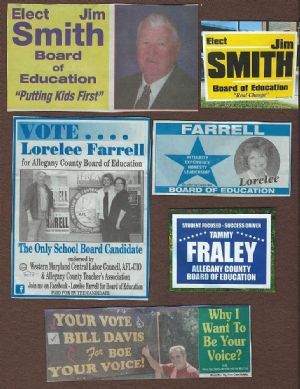 This page depicts the unsuccessful Allegany County Board of Education candidates from either the 2014 Primary or General Elections. The six successful primary candidates who moved onto the November 4, 2014 General Election included the two incumbents, Sara-Beth James and Laurie Peskin Marchini, as well as Wayne T. Foote, Lorelee Farrell, James M. Smith, who promised "Real Change", and Bill Davis. Tammy Fraley, whose campaign material identified herself as being "Student Focused - Success Driven," ran a close but unsuccessful race. As a result of the November 4, 2014 General Election, Sara-Beth James, Laurie Peskin Marchini and Wayne T. Foote were elected to the Allegany County Board of Education.